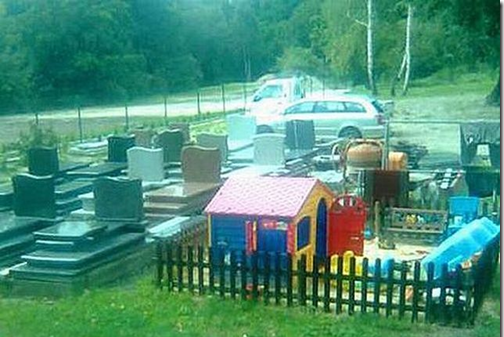 It probably a place where they make headstones and they also have a company sponsored day care facility. It makes sense I guess. Whoever thinks that is a large enough play area for more than maybe two kids is a god damned moron. That’s plenty of space for 4-6 kids or 8-10 Asian kids. You just have to shorten their leashes some more. Jewish or Redneck or Adams Family. One of those. Either way this is very fucked up. This is like a dream play area for mexican kids.